We started with afternoon tea while rocking on the lodge deck. Mount Mazama could be planning a comeback. Its eruption 7,700 years ago emptied the magma chamber below and the mountain collapsed, creating a caldera six miles across. Centuries later, it had filled, becoming Crater Lake, the deepest lake in the now-United States at 1,943 feet. Mazama is still active and an eruption could fill Crater Lake with rock, displacing 4.9 trillion gallons of water, more than all of Oregon’s other lakes and reservoirs combined. No rivers or streams feed the lake and there are no outlets other than seepage of a few billion gallons a year. The result is water so clear that it is a blue like you have never seen. You must see it to believe it. One way is to drive the rim, about 33 miles, with many observation points. Or, you can leave the driving to a trolley pilot for $27 and hear a ranger narrate the journey. Many bicycle around the lake and some walk. There are plenty of hikes, some quite short and some strenuous, taking you to mountaintops or down to the lake surface. Beginning late June, there are guided boat trips around the lake as well. Thanks to a light winter that allowed the road to open about two weeks early, we drove the rim road. The lookout views were spectacular, each providing a unique perspective of this amazing place. 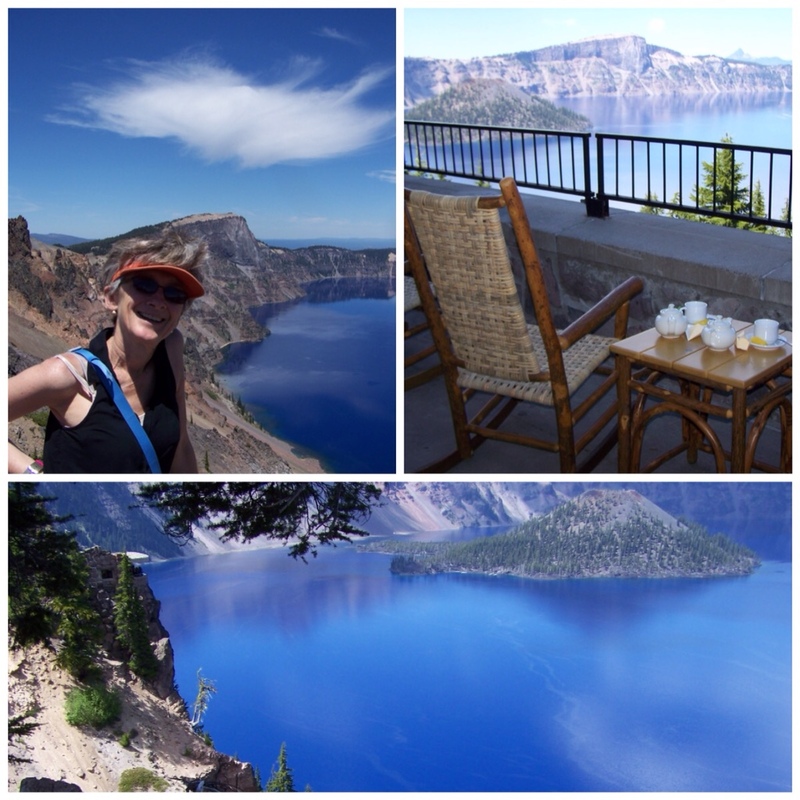 But our favorite view was from rocking chairs on the deck behind the Crater Lake Lodge, where we sat for several hours, uttering “oohs” and “ahhs” as the colors and reflections changed by the minute. I swear, the chardonnay was not a factor. Like I said, you have to see it to believe it. When you do, you could stay at the lodge on the rim’s edge. It has 71 rooms and is open May through fall. You can book a year in advance; we got our booking in January. The restaurant is excellent and dinner reservations are advised. Breakfast and lunch are also served. The lobby is a comfy place to hang out and play board games. There are also cabins, restaurant, store and campground at Mazama Village near the south entrance. But hurry, because Mount Mazama may have other plans. 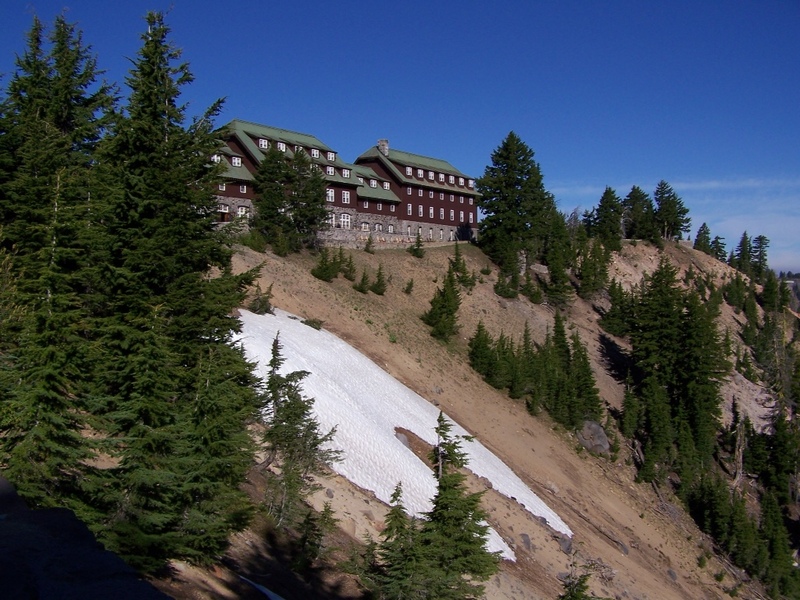 The Crater Lake Lodge offers panoramic views of Crater Lake. Crater Lake is so beautiful. The lake is truly an amazing color.